"Ursula Rose Rae and Elnaz Yazdani are visual mixed media artists. Playing with material, scale and technique they push textiles into new, exciting contexts. Engaging the audience in simple making techniques they will explore the process of collective making to create exciting sculptural forms and transform this space into an immersive tactile installation. Growing over the course of the week the work will constantly change and evolve with the help of the public." 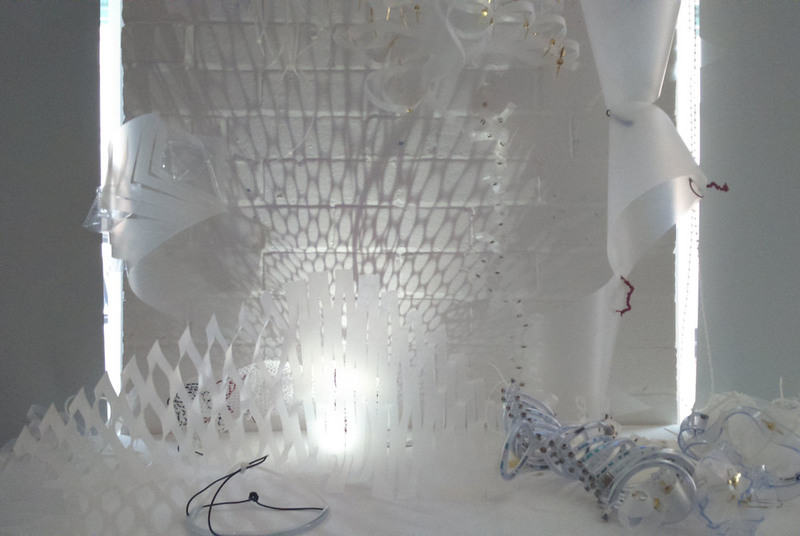 Join us at PLY over the course of the week to assist in creating a tactile installation! We shall be documenting the installations progress on social media through our instagram and twitter accounts and also through a livestream! So make sure you follow along! Over the weekend of the 23rd-25th, Free For Arts Fringe took place at the Manchester Craft and Design Centre, which showcased a range of work from the artists taking part in the full event in 2016. With exhibitions across three days for the public to view, additionally the artists taking part in the event also spent time getting to know each other, through conversations, making, and artist talks. I was fortunate to be asked to run a workshop for the CoLAB part of the day on the Saturday. Recently I've begun an exciting collaboration with my fellow Manchester School of Art graduate Elnaz Yazdani - having worked alongside each other for many years at university and more recently in our commissioned archives for The Whitworth Tactile Too collections, we have a strong understanding of each others practices, so are very excited to see the results of the culmination of our ideas! Top Left & Bottom Right Images Courtesy of Elnaz Yazdani. Our first collaborative project will be for the Free For Arts Festival this year hosted by Juncture, in October 2015. I shall be back with more updates closer to the time. In the meantime, you can check out Elnaz's work here. And also find out more about the Free For Arts Festival on their website, facebook page or twitter feed.